Here’s how to keep your human hair extensions in lookn there best! Your new long hair will take some getting used to, but with the proper aftercare routine, they will look beautiful until they are removed. Using the ultra small bristle brush, thoroughly brush your extensions a minimum of two times a day and before every shampoo. Start by detangling the ends and brush up towards the roots. Make sure the hair extensions are tangle free in the root area. WASHING – Wait 48 hours before washing after extension service. Wash extensions a least once a week to prevent natural oils from accumulating at the scalp area and more frequently when needed. Only use Softening Conditioner and Leave-in Conditioner. Take care in keeping conditioners 3 inches away from attachment zone. Thoroughly wet the hair. Your head should be in an upright position allowing the hair to flow in a vertical direction down the sides of the head. Distribute shampoo evenly in palm of your hand and apply to hair starting at the ends and working your way up to the scalp area. NEVER RUB, SCRUB OR BUNCH HAIR TOGETHER WHILE WASHING. Press and squeeze shampoo gently throughout the hair from ends to roots. Repeat as needed. RINSE THOROUGHLY. Gently squeeze excess water from the hair. Distribute conditioner using downward strokes from mid-shaft to ends. NEVER APPLY CONDITIONER TO THE ATTACHMENT ZONE. While conditioner is in the hair gently begin detangling the hair from ends to roots using the Loop brush. Consult your professional stylist with issues concerning hair color or any other chemical services you might need in between extension retouches. Let hair air dry when ever possible, proceed to style. Avoid using high heat styling tools. For added shine frizz control La Gem Diamond Glass should be used once only in between each shampoo. Spray leave-in conditioner brush, detangle and separate extensions at the root area completely. Blow dry or curl hair with care. Keep heat away from the attachment zone and use a diffuser whenever possible for better heat distribution. 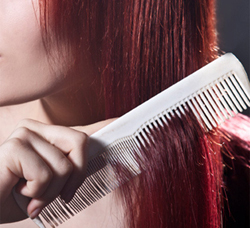 Always hold extensions while brushing to avoid tension on the root area. Curling or flat irons and heat rollers may be used, but avoid heat to attachment area. Always shampoo hair after swimming or rigorous activities. Dry hair thoroughly before going to bed. NEVER GO TO SLEEP WITH WET HAIR. Long extensions should be braided into one big braid before going to bed to prevent tangling and maintain style. Consult your professional stylist with issues concerning haircolor or any other chemical services you might need in between your extension services. Plan to service your extensions with your stylist every six to eight weeks in order to maintain your hair beautiful, healthy and trouble free.